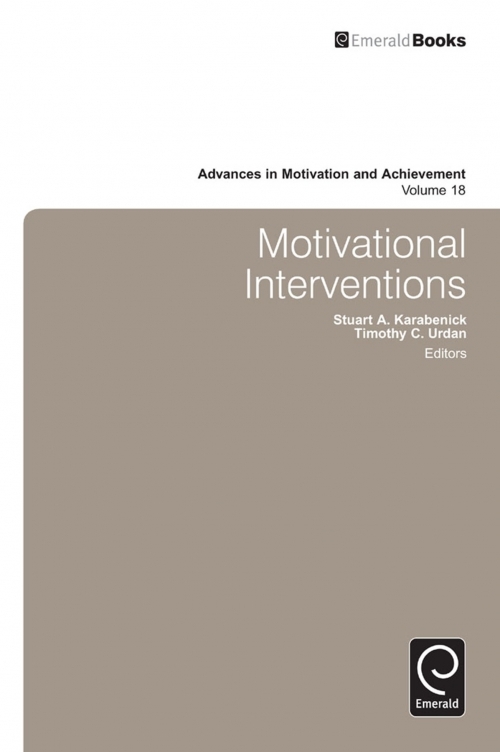 Advances in Motivation and Achievement, as the premier series in its field, explores current issues at the cutting edge of motivational science and reflects the richness and variety that exists across achievement and motivation research today. It brings together researchers in motivation from around the world to address new directions in measures and methods for motivational research. Attribution-Based Treatment Interventions in Some Achievement Settings. Intervening to Improve Children’s Reading Motivation and Comprehension: Concept-Oriented Reading Instruction. Harnessing Values to Promote Motivation in Education. Going Beyond the “Whoa! That’s Cool!” of Inquiry: Achieving Science Interest and Learning with the ICAN Intervention. Motivating Students by “Personalizing” Learning around Individual Interests: A Consideration of Theory, Design, and Implementation Issues. Fostering Positive Narratives: Social-Psychological Interventions to Maximize Motivation in the Classroom and Beyond. Identity-Based Motivation: Core Processes and Intervention Examples. Design-Based Interventions for Promoting Students’ Identity Exploration within the School Curriculum. An Intervention-Based Program of Research on Teachers’ Motivating Styles. Theory-Based Interventions with Middle-School Teachers to Support Student Motivation and Engagement. The Emergence of Mindfulness-Based Interventions in Educational Settings. Copyright page. Motivational Interventions. List of Contributors. Preface. Advances in Motivation and Achievement. Motivational Interventions.